Observed on the drive home today. A slightly tatty first generation Smart Car, with the license plate: RATTRAP. I drove behind, chuckling. Exactly my kind of humor. SciAm: Toxic Spill in the Navajo Nation. Within a year of the spill, Chief herself explored the unique ways that the Diné could be exposed to contaminants in the river, by surveying the communities. She found that her people use the river in more than 400 ways, including cultural, medicinal and spiritual practices, such as putting river clay on their face for prayers and collecting and crafting reeds for baskets. This survey illustrated the potential exposure pathways for Navajo community members not captured in the recreational risk assessment. Ill-applied science can wield some hideous blinders sometimes. Question is, is it intentional? SF New Mexican: Webber elected Santa Fe mayor in four-round ranked-choice election. The ranked-choice process was slow; you should have seen all the mad-face emoji on the New Mexican's Facebook live video feed last night. If you squinted, it looked for all the world like someone was throwing oranges across the room. What do you need to know in the face of all this crowing? The winner of any contest needed to have over 50%. In the first 'round' - the straight-up conventional election - Webber got 39% of the vote. After the fourth round of eliminations (each round eliminates the lowest-scoring candidate), he had 66%. Time will tell whether this is truly the voice of the people. It certainly points to interesting downticket strategies for the parties. Some didn't like the system, and allegedly only wrote in single vote choices. I wonder how that ranked-vote-suspicion played out across constituencies. CBS: Santa Fe on hunt for mayor worthy of six-figure salary. Ranked choice is certainly primary on the ballot, in spite of the personalities listed here. It's gonna be interesting. This is going to be a very, very dry year. Like blue Mason jars ... very likely the same age. 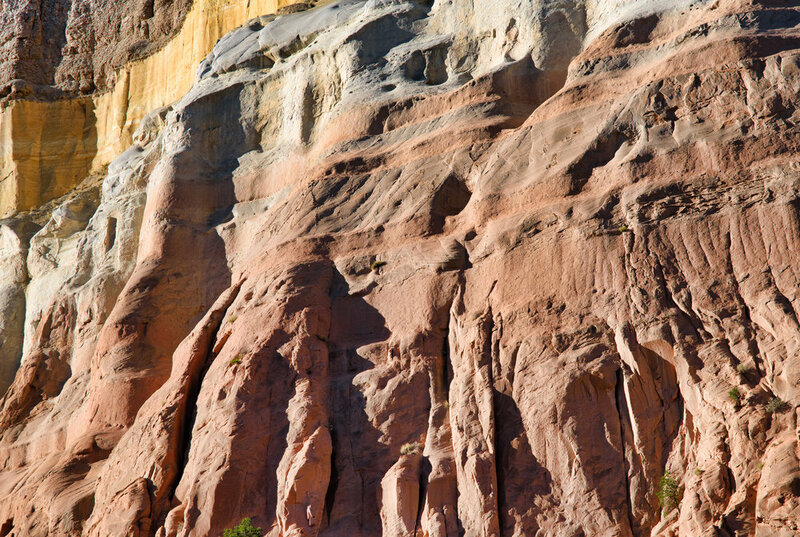 Near Ghost Ranch. Click to view large; it's all those little micro-creases that make the shot. IMHO. Too cold out there. Bitter winds.